KATHMANDU, July 19: Investment Board Nepal (IBN) has approved Project Development Agreement (PDA) document to be signed with NepWaste -- a Nepal-Finland joint venture company -- for implementation of Integrated Solid Waste Management of Kathmandu Valley Package 1. 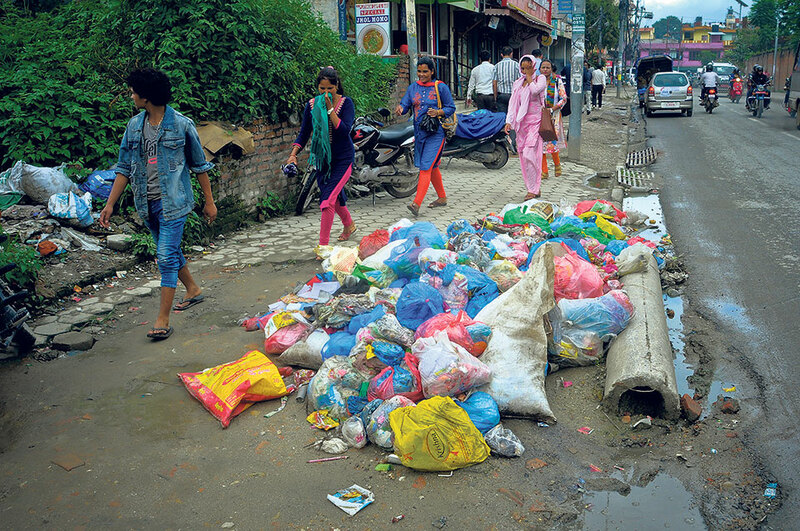 NepWaste, which has been assigned the task of waste management in Kathmandu Metropolitan City (KMC) and nine other municipalities, will start picking up garbage from the city within three months of signing of PDA, according to the document. The approval paves way for signing PDA with the company and kick-start waste management works of Package 1. IBN is planning to sign PDA with NepWaste soon. The board of IBN held on Tuesday approved the PDA document, ended the stalemate caused by the indecisiveness of KMC for over four months. The company will not only collect garbage from each household and sweep all the streets and public places, but will also use the waste to produce chemical fertilizers and generate 5 MW of electricity from the plant to be set up at Banchare Danda of Nuwakot. “After signing PDA with IBN, NepWaste will have to sign separate Memorandum of Understanding (MoU) with KMC and nine municipalities before starting the process to build the plant which could take two years,” Uttam Bhakta Wagle, the spokesperson for IBN, told Republica. The project, which is estimated to cost US$ 50 million, is being implemented on build, operate, own and transfer (BOOT) model. The company will have to hand over the project to the government after 20 years. It will pay Rs 2 billion in royalty to the government over 20 years. Package 1 of the project covers KMC and Dakshinkali, Chandragiri, Nagarjun, Tarakeshwar, Tokha, Budhanilkantha, Gokarneshwar, Kageshwari-Manahara and Shankarapur municipalities. IBN is yet to start PDA negotiations for Package 2 and 3 of the project, which covers metropolitan city and municipalities in Lalitpur and Bhaktapur districts as well as remaining areas of Kathmandu district. The IBN has also decided to do the needful for deciding the fate of West Seti Hydropower Project by holding further discussions with China Three Gorges International Corporation (CTGI).